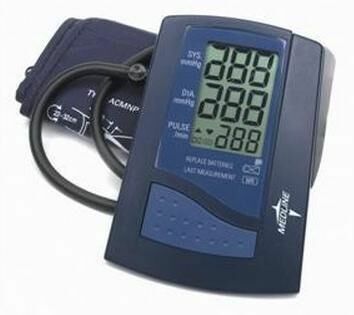 Automatic digital blood pressure units haveautomatic inflation and error detection thanks to to the "fuzzy logic" programming. The easy one-button design provides accurate and reliable readings. "Fuzzy logic" circuitry allows this unit to customize inflation levels for individual patients. Eight-bit processor provides unsurpassed accuracy. Features auto pulse readings, memory, and large digital readout. Operates on four AA batteries. Unit with a Standard Adult Cuff that fits arms 22-30 cm, 8.66"
Unit with a Standard Large Adult Cuff that fits arms 30-38 cm, 11.80"-14.96".